When your garden lettuce turns bitter and is no longer suitable for use in a salad, it can still be delicious as a cooked green! No, you don’t have to worry about the bitterness. It will disappear as the greens cook. I discovered this only this year. A friend called me to tell me about seeing a similar recipe on a cooking show. Now it’s one of our favorite dishes and I fix it once or twice a week. I call it Mediterranean Cooked Greens. Take a large bowl half filled with water to the garden with you when you pick. Immerse the lettuce — or whatever mix of greens you’re picking — in the water immediately after picking it. You’ll need a bowl full. Lettuce like spinach shrinks when it cooks. You can use one variety of greens or use a mix of lettuces and other greens. Beet greens, borage, spinach, any oriental greens, arugula, romaine lettuce and any other kind of lettuces you may have. Harvest good looking leaves. They can be large or small. If leaves are big, I usually tear them. Place in large bowl and drizzle with olive oil. Add about 3 medium coarsely chopped onions. Toss ’till well coated with oil. Bake 350 degrees for 30 minutes. Remove from oven and cover with a top or a tent of tin foil. This keeps the greens moist and soft. Return to oven and bake 15 to 25 more minutes. 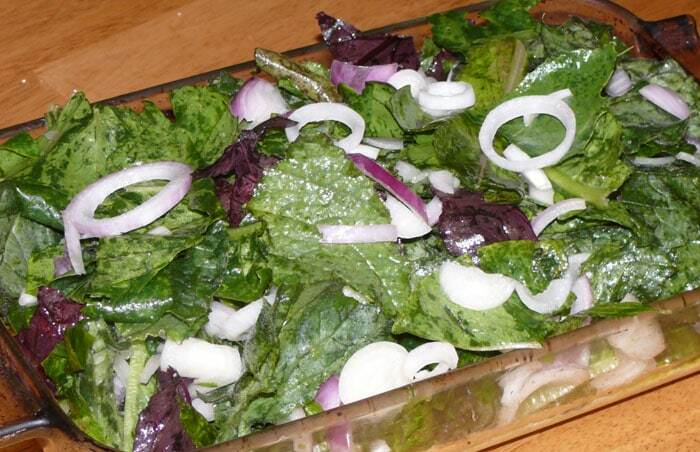 Mix greens and onions coated with olive oil are in baking dish and ready to go into the oven. To make this dish even better serve with crumbled feta cheese on top and some type of cornbread. 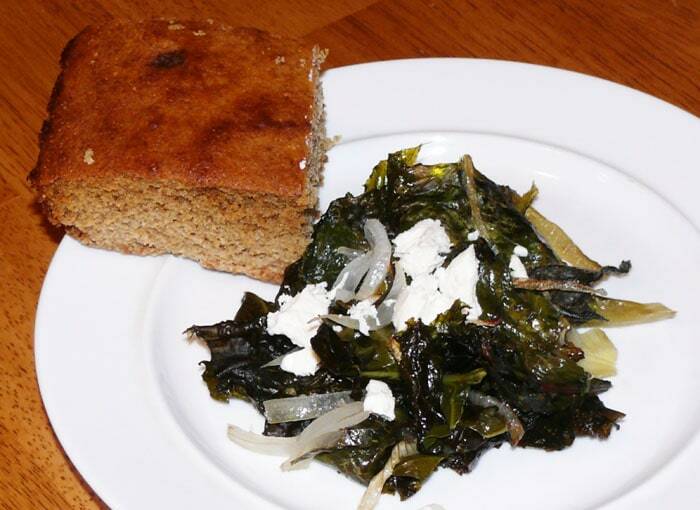 Cooked greens, feta cheese and corn bread. In case you want to check out the original recipe for Wild Greens Pie that my friend saw on the cooking show, here’s the link. Thanks for the recipe. I’ve got to try this one! Did you check out the original recipe link as well, Diane? I think I will try this on the stovetop, rather than the oven. I’ll report back if I am successful. Yesterday, DH and I took everything out of our big chest freezer, and put the viable foods (most everything) back in chronological order. Not quite as refined as I am aspiring to be, but pretty darn fantastic! Your post on freezer org inspired me. Thanks for all your posts, Theresa. I too plan to try this on the stovetop. Think it will be great. Plan to saute garlic with it just before adding the lettuces. So I’ll look forward to your reporting back and gaining the benefit of your experience. Congrats on the freezer job! It’s always a sense of accomplishment to get that done. Sure glad my post inspired you. Thanks for commenting, Gail. I always enjoy hearing from you. Interesting idea. I want to try this. We still have lots of lettuce left and it’s starting to get hot. Now I can use it if it turns bitter. Knowing I could use all my bitter lettuce was one of the most exciting things for me when I discovered lettuce as a cooked green. People in other parts of the world have been using it that way for centuries, but I sure didn’t know it. Good to hear from you, Christine. Hope you’ll enjoy trying this. I tried this tonight and my husband and I enjoyed it! The feta is a nice touch. I think it would be good to try it sauted too. I never knew lettuce would work as a cooked green. I’m so glad you and your husband enjoyed it Christine! Bill and I tried it sauteed the other night and didn’t care for it at all. Taste is just not the same. Gail (see her comment) had said she was going to try it stovetop and report back if she liked it. Haven’t heard from her. So if that any indication —- she didn’t care for it either. If you try it stovetop and like it, let us know how you fixed it. Lettuce as a cooked green opened a whole new dimension in the lettuce department. Love it! I did a stovetop version incredibly bitter lettuce- not only over wintered, but lasting until May ( about 1/2 to 2/3rds lettuces) with bolting kale and chard (the other third.) I went heavy on the onions and garlic and finished it with salt, pepper, and balsamic vinegar. I topped it with Feta. With these strong flavors- it was very edible. I let it cook down and pushed the greens up to the edges so the juices and balsamic would concentrate. Pretty good stuff. Now I don’t feel so guilty for letting my lettuces go! Glad you gave that a try Jill. Do try the roasted version — you’ll be amazed at how even more delicious it is! I chopped up some tough fall lettuce, and added chopped onion, tossed with olive oil and salt red pepper flakes and 1 tsp of liquid smoke. placed it covered in the microwave for 4-6 mins and let it sit and steam for another 10 minutes. I will try roasted, when i have more time. Just tried this recipe with a little variation. I used my garden lettuce and spinach (both always bitter) added whole cherry tomatoes with the onion and greens. Added just a small splash of balsamic. Topped off to serve with feta and almonds. Was delicious. FYI: anyone in the australian region, oven comparison is 180 degrees Celsius. Thanks for letting me know you tried it Alysha. Bill and I love a splash (sometimes several) of balsamic with greens. Really makes it good.